Who ever though that such a “little piece of paper” could have such enormous real and symbolic importance in one’s life? 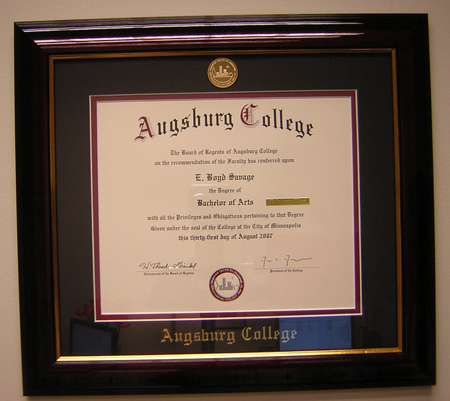 It took four years of serious hard work, from August, 2003 to June, 2007, to earn this degree – plus about 10 years before that of taking one class at a time here and there to get rid of my core curriculum requirements. Well, never mind that now. I have it. I stuck with it until I got it done. I can’t tell you how proud I am of myself for sticking with it until I was done this time. This time, I knew it was now or never. Making a big commitment to oneself and then seeing that commitment through to the end brings an immeasurable amount of self-esteem.